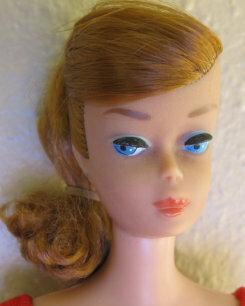 The 1964 #850 ponytail has a new updated hair style! She no longer has the curly bangs. She has grown them out and swirled some of them across the front of her forward. And that is how she got her nickname "Swirl Ponytail". Her hair colors were platinum blonde, Ash Blonde, Lemon, Brunette or Red. 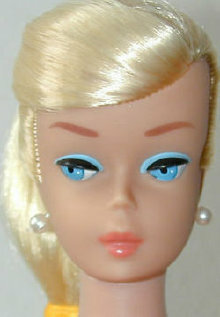 She has blue eyes and a variety of lip colors. 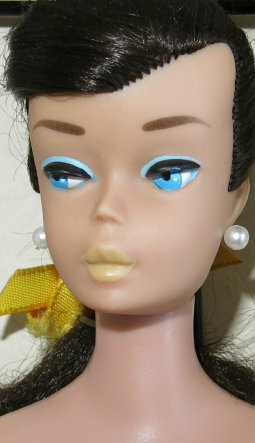 She is on the barbie/midge body which is the same as the bubblecut in 1963. The later issue Swirls have the word "patented added". She came dressed in a red swimsuit and came with various hair and lip colors. 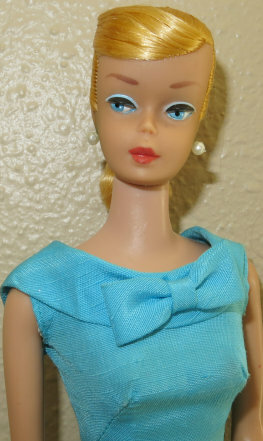 Her body is marked: Midge T.M./©1962 Barbie ®/©1958 by Mattel, Inc. (In 1964 "patented" added to the end). In the box: Barbie with red swim-suit, pearl earrings, red open toe heels, yellow hair ribbon, gold wire stand, and booklet . 1964 Brunette European Swirl (#850) dressed in her original swimsuit with lips that have turned a pretty buttery lemon color.